Aimee Petras, Outreach and Education Coordinator for the Farmington River Watershed Association, will outline why installations of bioswales, rain gardens and river buffers are important for the river, showing some local examples. She will explore ways to reduce stormwater and improve water quality in our community. Free downspout disconnect kit for Bristol residents! 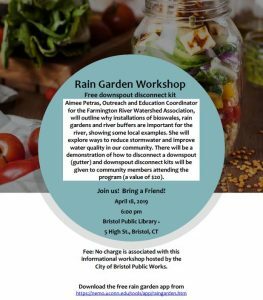 There will be a demonstration of how to disconnect a downspout (gutter) and downspout disconnect kits will be given to community members living in Bristol attending the program (a value of $20).